* Super Power ~ Would choose the ability to be in more than one place at one time! * Top 3 baby items right now ~ The New First Three Years Of Life by Burton L. White, the Winkel toy by Manhattan Toys, and a sound machine! I am beyond thrilled to introduce my first lovely spotlighted lady! 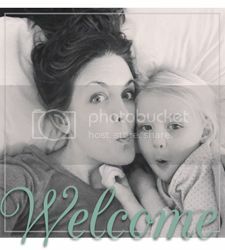 Ashley Edmonds is a new mom AND a new business owner. In fact, Ashley and her husband created beautiful, reusable gift wrap called Lilywrap. I often feel so far removed from the early days of being a new mom. Ashley’s innovative product and new start in parenting made her the first person to pop into my head for this portion of Isn’t She Lovely. Ashley is someone I have known for a long time, but also someone I hardly know! I am friends with her brother and his wife. Ashley and I run into each other at random events, and she is always so easy to talk to. On the day that I went to have a chat with her at her home it was like we had just hung out the day before. Her personable demeanor has always made her stand out as a lovely person to me. Before writing this post I wasn’t really sure how this was going to go down. Would I interview her and just lay it out there for you? Or would I tell it in my own words so that you could really get a personal feel for how lovely she is? I decided anyone can interview someone and type it up. It takes quite a lot more effort to really paint a picture of someone in words. Here goes nothing! My first goal in getting to know Ashley was to find out what inspires her, what being lovely means to her, and who in her life has encouraged her to be lovely. She is heavily inspired by those who exhibit a certain level of grace. What a great word right? GRACE. Specifically, she really appreciates those who seem to have the right response in tough situations while also being able to say no gracefully. I don’t know many people who don’t struggle with that. I loved her explanation of grace in the sense that a person can do all of this and be honest at the same time when they don’t feel as under control and graceful as they would like. Ashley is inspired and encouraged to be lovely by her mom. She stated that her mom has always had that “do the right thing and be nice to people” mentality. She never had to say it, but her kids still knew it to be the truth. Ashley’s mom stayed home when they were little, and this really stuck with Ashley when her own decision to stay home came into play. She truly feels that her mom had such an important and beneficial influence on who she is today that she wants the same for her daughter. She wants the chance to show Emily through her own daily actions the kind of grace and loveliness that her mother impressed upon her. Therefore, being lovely for Ashley means being nice to everyone you meet and loving them for who they are. My second goal here was to find out a few things about Ashley as a mom and as an entrepreneur. These two “jobs” aren’t as different as they might sound. Ashley’s all time favorite aspect of being a new mom is hearing Emily laugh and seeing her smile now on a daily basis. As babies do, Emily was on a spurt of waking up very early after a while of having normal nights of sleep. Ashley said that walking into Emily’s room at 5 am became a joy the minute she would see Emily kicking and smiling away! I wish in my earliest mommy days someone had used the phrase “highlight reel”. All aspects of life have become that way due to social media, and it can be quite an overwhelming thing. It makes me scared for those very young moms or the moms who find themselves becoming a mom without necessarily being ready. Don’t compare yourselves ladies. The highlight reel is never anywhere close to the real thing! BUT, I will take a section from Ashley’s reel because that’s what we’re doing here in the most positive way. We are lifting her up and inspiring everyone else with her loveliness all at the same time. In regards to being an entrepreneur, the story of Lilywrap is pretty fascinating. Ashley’s husband Ryan is the type of guy who keeps a list of big ideas in his phone at all times. While Ashley was getting her MBA at the University of Georgia she was tasked with the job of pitching a business idea for a competition in one of her classes. She immediately went to Ryan asking for input and decided on reusable gift wrap as the idea to pitch. Using her sewing skills Ashley created a prototype, and when it was all said and done Ashley’s team ended up winning the competition in July of 2011. Ashley and Ryan moved forward with Lilywrap and launched it at market in July of 2012. Since then they have been working hard to grow the business and build the product name. Ashley’s biggest advice to anyone interested in doing something similar is to make use of your resources. If you don’t know how to get started or what to do at a certain point in the process, seek out people who do. Ask a lot of questions and always understand that whoever you are asking had to have some help at some point too! You will only be better for it when you seek out information from those who have been there. Again, not so different from parenting right? 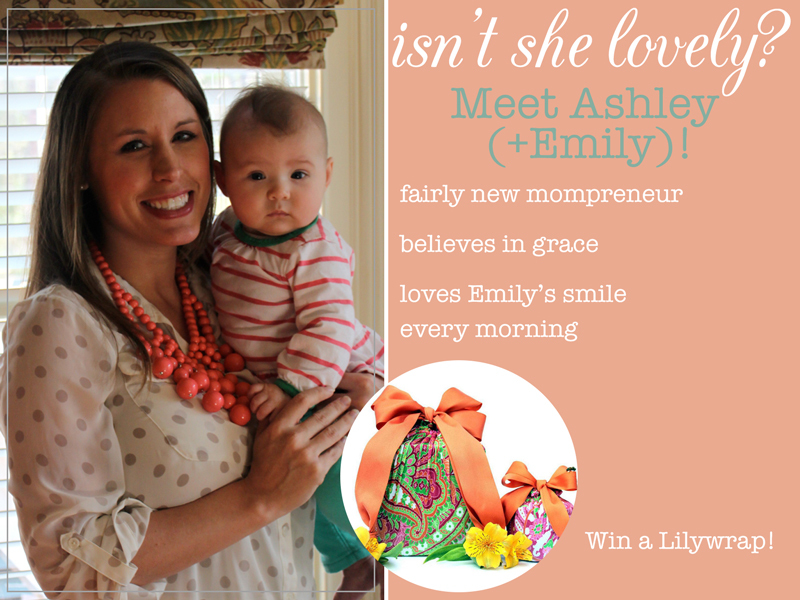 In honor of our first Isn’t She Lovely feature there is a Lilywrap giveaway! I have always been hesitant to jump on the giveaway bandwagon. However, in the spirit of celebrating the lovely people out there and the amazing things they create and sell, a giveaway is a must! If you would like to win Lilywrap gift wrap simply leave a comment letting us know which Lilywrap pattern you would pick. If you are lucky enough to be the randomly chosen winner it will be shipped straight to you! I do ask that you comment by midnight Monday night. I will post the winner on Tuesday. Thank you for taking the time to read about Ashley. If nothing else, I hope these features get you thinking more and more about the lovely people in your life that you would like to recognize in some small (or big!) way. Learn from them. Appreciate them. Lift each other up! Love everything about the new direction of the blog! Especially this type of post. I have been saying for too long that we women need to hold each other up more rather than tear each other down. Holy love the product, batman! I love the purple paisley. These would make a great gift as well! I thought I knew her pretty well, but reading her views on being a new mom and business owner gives me a whole new respect for her! I love the Green Bubbles print, if I win the giveaway. Jana I just love this! And I agree that Ashley is pretty lovely! I also love lilywrap and Purple Paisley. Love the yellow medallion. Congrats on your new endeavor! I love the article! I can't wait for future stories of amazing women :) For the drawing, I would love to win the classic silver wrap! What a terrific idea...both the LilyWrap and also highlighting amazing people! If I were lucky enough to win, I would like the Green bubbles. What a great post, Jana! Love my SIL! in the women around us. I think Ashley embodies what you are looking to highlight. I hope that your blog continues to remind women that we are all on the same team! What a beautiful lady to feature! And Jana I love the way you painted the picture of Ashley as a mother and entrepreneur! I love the green bubbles print. jcaicedo you are the winner! Email me with your contact info so that we can ship you the classic silver wrap ASAP!